At a press conference held in Sandton today, The Cape Town International Jazz Festival (CTIJF) heralded its 18th year with a brilliantly edgy, instantly-appealing and musically broad line-up that will captivate jazz purists, world music fans, fusion lovers and soul nostalgics. The first artist announcement line-up that will grace the festival’s five stages on 31st March and 1st April 2017 drew appreciative support from the assembled guests and media. The CTIJF has consistently shown that it is in tune with what its audience wants. This was proven last year, when the festival earned the number one spot in local festival favourites and was acknowledged as being one of the top music festivals in the world by Fest 300. Part of its enduring success is its ability to harness the voracious and diverse musical appetite of its fans, fondly known as ‘festinos’. In this carefully considered array of performers, the CTIJF demonstrates its ability to once again deliver what fans expect – an eclectic mix of jazz greats, emerging stars and social commentators with an exceptional experience that leaves a lasting impression (for all the right reasons), against the breath-taking backdrop of one of the world’s most visited cities. Contemporary jazz supergroup Jazz Funk Soul with Everette Harp, Jeff Lorber & Paul Jackson Jr (USA), a line-up uniting three of the world’s most admired fusion players: saxophonist Everette Harp, keyboardist Jeff Lorber and world-renown guitarist Paul Jackson Jr.;one of the most successful female groups of all time, the ‘real funky divas’ of En Vogue (USA); multiple SAMA, KORA and Metro music award winner, guitarist Ernie Smith (SA) and the 2017 winners of the espYoungLegends competition VuDu (SA) – founding members Sisanda “Sunda” Myataza (vocals) and Kristo Zondagh (drums) are joined in this fresh incarnation by Wesley Keet (keyboards) and new bass player Grant Allison to produce a fusion of traditional and African jazz with urban contemporary genres. Jazz purists will enjoy the multiple award-winning jazz master, alto saxophonist, Rudresh Mahanthappa Bird Calls (USA); award-winning jazz vocalist and critically-acclaimed Gretchen Parlato (USA) who also has the distinction of being the first vocalist to be admitted to the Thelonious Monk Institute of Jazz Performance; the 2016 Standard Bank Young Artist of the Year for Jazz trombonist, vocalist, composer and bandleader Siya Makuzeni (SA); the multi-award winning and supremely talented Skyjack (SA/ SWISS) quintet comprising of bassist Shane Cooper, pianist Kyle Shepherd, New York-based drummer Kesivan Naidoo, tenor saxophonist Marc Stucki and trombonist Andreas Tschopp; Tune Recreation Committee (SA) helmed by trumpeter Mandla Mlangeni with guitarist Keenan Ahrends, Nicholas Williams on bass and Claude Cozens on drums; the award-winning Cape Town born trumpeter Darren English (SA/ USA)and the two-time Oscar-nominee, veteran composer, trombonist, bandleader and director Jonas Gwangwa & Friends (SA). Leading the line-up for urban fans is producer, singer-songwriter, keyboardist Taylor McFerrinperforming with rhythm man and highly-talented drummer Marcus Gilmore (USA); South Africa’s very own articulate activist who uses her musical rap and hip hop to highlight social commentary, Dope Saint Jude (SA); the inimitable, innovative British singer/songwriter and MOBO and Urban Music Award winner Laura Mvula (UK); award-winning, afro funk, jazz and gospel singer Judith Sephuma (SA); the infectious, assertive sound of The Rudimentals (SA)with their firecracker vocals and infectious mix of reggae, rock and dancehall; and the polished sounds of the Sekunjalo Edujazz Band (SA), under the direction of internationally recognised and award-winning arranger and pianist, Andrew Ford. For the suave, sophisticated and energetic fusion, African reedmen, Grammy-nominated Manu Dibango (Cameroon) and SAMA award-winning Moreira Chonguica (Mozambique); classical vocalist, violinist and composer Deepak Pandit (India) with SAMA-winning trumpeter and composer Marcus Wyatt (SA) and distinguished drummer Ranjit Barot (India); vibrant Latin music sextet Escalandrum (Argentina) led by drummer Daniel ‘Pipi’ Piazzola, grandson of the great Astor Piazzola who revolutionised tango music for new urban audiences; and the much-loved Soweto String Quartet (SA) with violinists Sandile Khemese and Thami Khemese and viola player Makhosini Mnguni, featuring Themba Machobane who replaces Reuben “Ompie” Khemese who sadly passed in September 2016. The Minister of Arts and Culture, Mr Nathi Mthethwa, pointed out that: "The Cape Town International Jazz Festival, now in its 18th edition, continues to attract the best musicians from South Africa and abroad; and the musical collaborations that result from this rich engagement produce music that captures the cultural imagination of our people, builds continental cohesion and speaks to the world at large." Ticket sales for the CTIJF were launched earlier this month. The considerable uptake from an enthusiastic market, endorses this festival’s enduring reputation for producing exceptional entertainment for discerning music fans, with many who return year on year, for a memorable experience. 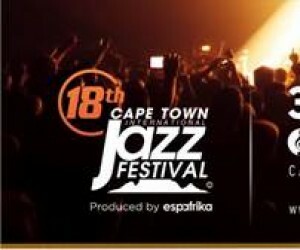 The official sponsors for the 18th annual Cape Town International Jazz Festival 2016 are: the Department of Arts and Culture, Independent Media and PRASA. Other sponsors include the City of Cape Town, Johnny Walker, Amstel and South African Tourism.